A shortcut provides a quick way to get things done with your apps, with just a tap or by asking Siri. Shortcuts can automate a wide variety of things—for example, getting directions to the next event on your Calendar, moving text from one app to another, generating expense reports, and more. 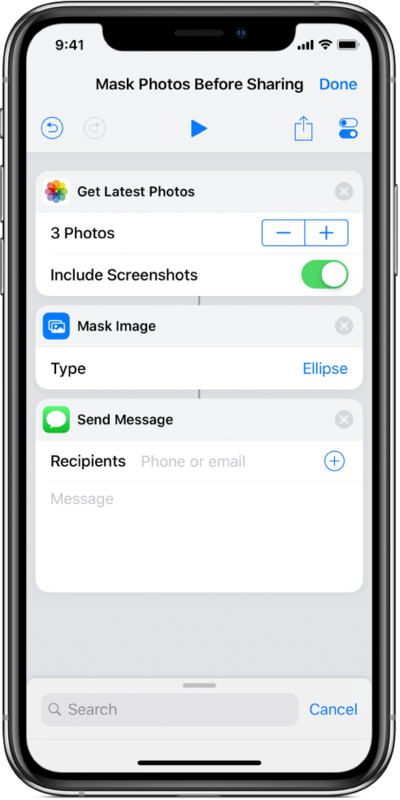 Based on how you use your iOS device—your app usage and your browser, email, and messaging history—Siri suggests simple, useful shortcuts that you can quickly tap to run. Once you add the shortcut to Siri, you can simply summon Siri, then say the shortcut phrase to run it. In addition to running the simple shortcuts suggested by Siri, you can use the Shortcuts app to add ready-made or custom shortcuts to your iOS device. The app lets you combine multiple steps across multiple apps to create powerful task automations. After you add shortcuts from the app Gallery or create your own, you can launch them in the app, from iOS Today View, from your iOS Home screen, or by asking Siri. An action is the building block of a shortcut. Each shortcut comprises a series of actions, and each action is a single step that performs a particular function. 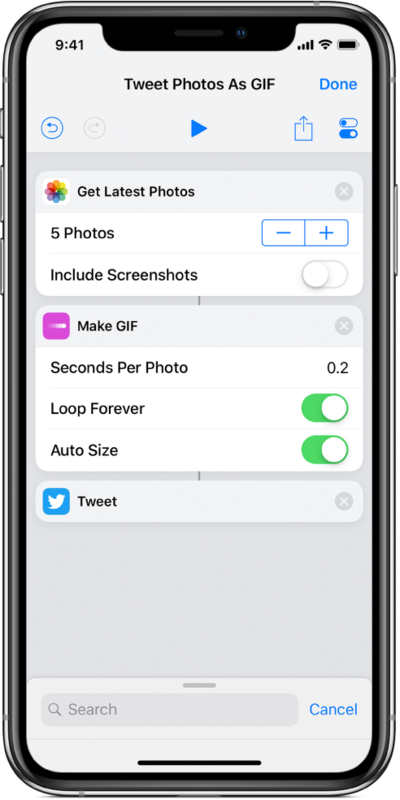 For example, a shortcut that posts an animated GIF to Twitter might contain three consecutive actions: Get Latest Photos grabs the latest photos that you took on your device; Make GIF uses those photos to build an animated GIF; and Tweet automatically posts the GIF to your Twitter account. When you run a shortcut, each action proceeds in sequence from the first action to the last action. By arranging actions that perform individual tasks in specific ways, you can define how a shortcut acts as it progresses through each step. Actions are the core building blocks of shortcuts, so the actions you choose and their order are key to making shortcuts suited to your needs. Shortcuts you create or select from the Gallery are stored in the Library section of the app. These shortcuts are available on your iPhone or iPad, ready to run at a moment’s notice. Each shortcut is represented by a rounded rectangle that has a title, an icon, and a color. Tap a shortcut once to run it, or tap to see the actions contained inside.